On Sunday 15th July Mazury performed as part of the Ognisko Polskie's Summer Party! This was Mazury's 3rd year and we were delighted to perform there again! This was a BBQ with a difference, there was delicious Polish food to indulge in as everyone relaxed with friends in a leafy spot in South Kensington, with live music from the talented Karolinka London Singers & the wonderfully quirky Mee & the Band. All of this, and the traditional ending of the kominek/campfire singalong, made sure it was another unmissable event! 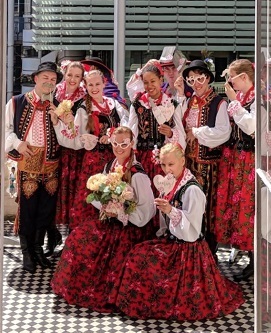 Welcome to Mazury Dance Company, one of the largest and longest-established Polish dance groups in the UK. Set up in 1949, we now have more than 100 members in three groups. If you would like to join us please get in contact.